These birds are named for the Gila River whose course runs through the Sonoran Desert—a location where Gila (pronounced "heela") woodpeckers are found in abundant numbers thriving in its hot, dry climate. The well-developed neck muscles, pointed beaks and strong heads of these birds enable them to drill through the exterior of trees and cacti to make the interior their homes. Gila woodpeckers are at home where it is hot and dry. They are found only in the southwestern U.S., from southeast California and Baja, California, southern Arizona and New Mexico down into Mexico, according to the Birding Information website. They prefer arid conditions that support little vegetation aside from cottonwood trees, date palms and cacti that require little moisture. The Gila woodpecker is found in plentiful numbers throughout the Sonoran Desert located in parts of Arizona, California and northwestern Mexico. The bird prefers the desert's low-elevation scrub environment, according to the Tree of Life Web Project. The low-elevation areas generally receive no more than 3 inches of precipitation per year—a fact that suits this bird, which thrives in dry conditions. 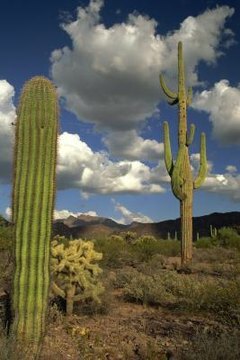 Summer air temperatures in the Sonoran Desert are routinely above 100 degrees Fahrenheit, according to the National Park Service. Gila woodpeckers and the saguaro cactus have a mutually beneficial relationship. The Gila woodpeckers use their tough beaks to drill holes in the cactus that the birds later use for nesting. The spines of the cactus provide protection from predators; the interior of the cactus provides protection from high heat. In return the Gila woodpeckers eat harmful disease-causing insects, according to the Birding Information website. You know when these birds are in the area. They are loud and unapologetic for making their presence known. When hammering into a cactus or, in the absence of cacti, a tree or telephone pole, the beaks of Gila woodpeckers make a characteristic drumming noise, according to the Tree of Life Web Project. They have a high-pitched "yip" and regularly call to each other, advertising territorial claims, according to the Birding Information website. They climb to the top of cacti announcing their conquests with a strident call, according to the Arizona-Sonoran Desert Museum. These birds range from 8 to 10 inches in length. They weigh about 3.5 ounces and their wingspan is approximately 16 inches. Males and females both sport tan coloring on their heads, necks, throats, breasts and bellies. The male has an additional red cap on the top of his head. Black-and-white striping covers their rumps, wings and backs, according to the Birding Information website.